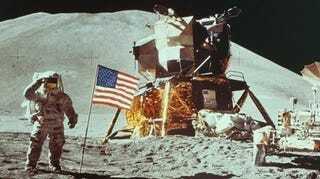 Tomorrow is the 40th anniversary of the date humans first landed on the Moon. Earth's satellite has been a setting for games, or levels in them, going back to Lunar Lander in the 1970s. The Toronto Star waxes nostalgic about moon games in a writeup that spans some of the major games set on the moon, in whole or in part. Naturally, Williams' Moon Patrol stands as one of the granddaddies; Atari's Lunar Lander of 1979 - an arcade port of a game common to PCs before then - was something of an oddity, a science-fiction game that was non-violent. Well, unless you crashed your lander, of course. In addition to those two, Military Madness, Command & Conquer: Yuri's Revenge, Duke Nukem 3D, the Legend of Zelda: Majora's Mask and I Wish I Were the Moon are all mentioned for featuring the moon, in whole or in part. I'm certain there are more than just those games. For example, DuckTales' moon level - cited by many as having the greatest level music of the chiptone era. So what else did the Star miss in the Moon? Think it over, while you play this lunar lander flash game. Or listen to President Kennedy's address of Sept. 13, 1963, one of the best in his campaign to make landing on the moon by the end of the 1960s a national priority. Why, indeed, does Rice play Texas? Maybe InsidiousTuna, as the private-school doormat representative from that state, can tell us.